This special Pearl series product has been developed using nano technology. The nano skin care technology involves the inclusion of nano particles in the range of 100-140 microns within the products that can get deeper into the skin to produce beneficial results and is produced at the state of the art manufacturing plant that ensures both base and active ingredients are treated with utmost care to give optimum results. 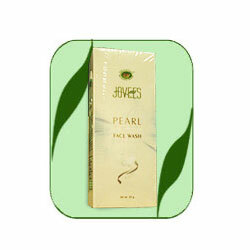 This Pearl Whitening face wash effectively removes impurities, helps to lighten discoloration, maintain fair skin. Massage onto wet skin, work into lather and rinse. Pearl powder, Bearberry fruit extract, Alpha hydroxy acid (Derived from Vitis vinifera), Liquorice extract, Soya protein extract.